EDIT Regal Earring and Regal Ring set bonus will now apply. Had to change the set bonus res file, and the code to parse it. Thanks once again Ragnarok.Martel for the bug report. I tested today, and without equipment, my att and acc are wrong for less. I did the Mauha test with war/sam. Thank you for the compliment and taking the time to check the addon out. In regards to acc and att values being incorrect while naked, the formulae to calculate those values may be different to when weapons are equipped. I get the same issue, but i did check the calculations and they are returning correct values for the formulae listed on BG. Until someone calculates another formulae while naked i cannot fix it. But.... no one plays naked (in game ^^) as far as im aware. Popping in to say THANK YOU for all your hard work. If not the best, this is one of the best add-ons FFXI has seen in years. Your continued support is huge. So. I have a potentially interesting acc related feature request. The exact formulas are known(I may have had something to do with that...) so provided you can check the PLD's divine skill and JP on cast, it should be possible to correctly calculate the potency and add it to the accuracy total. Time to complicate things. Enlight degrades by 1 potency for every hit that lands. Both the additional effect dmg and acc bonus. So if you wanted this to really be accurate, it would have to active track everytime a hit lads and reduce the acc value. Enlight dmg can be affected by weather and elemental affinity, but not by MAB) So weather procs, and some gear can adjust the DMG but would not change the acc. Oh and also, Excalibur's add effect can proc over enlight, and looks exactly like enlight, but hits vastly harder. And finally. Runes. Runes have priority over Enlight when both buffs are present. Meaning that the add effect that actually procs on the monster in that case would be the Rune. Interestingly, even though the Rune is procing, you still get the enlight acc bonus. So Runes effectively prevent the acc bonus from degrading. Which is quite useful. So you'd need to make sure to disable enlight degradation when runes are up, and not set the acc+ based on en dmg. Have I made things complicated enough? I just thought it'd be really cool so be able to actively track enlight acc+. So that if you know how much acc you need, you just recast when it degrades to at or near that point. Could even potentially make some gearswap stuff to take advantage of extra acc from enlight until it degrades low enough that you need more acc gear. Anyway. I realize that this would probably be a huge pain in the *** for one rather niche thing(PLDs actually DD'ing.) But if you feel up for it, I thought I'd provide some information about it. Besides I had fun typing this up. I'm afraid thats gona be on the back burner lol, i have other priorities unfortunately. I'm currently working on fixing attack tracking, as i completely omited Smite from my calculations, adn also goofed, where i thaught that geo and cor buffs were always a flat value like BRD. which it isnt. so ive had to change my resources such that cor and geo attack buffs are attack %, and altered the formulae to correctly add all the multiplyers together. This opens up the addition of extra buffs like berserk, warcry etc etc etc. Also from this testing i realised i also omited brd jp minuet and minne bonuses, so these have been added to the settings file. That's fine. I'm aware it's a pretty niche thing. It was interesting to think about how it would be implemented though. it is a valid idea, dont get me wrong, and i dont look at anything as niche as i would love to add EVERYTHING to GI, but i just think there's bigger fish to fry first ^^. This addon is amazing! automatically tracks all my dw levels on blu and nin so I know exactly what I need vs what I have. Amazing Seb another hit! I know exact attack values, haste, acc all in real time. Seb helped me maximize my Nin lua and made sure I had all the right gear in all the right places. This guy does it all! Hi, really like all the updates. Also unrelated I wanted to add a MA section to my nin lua for when I have to use h2h, I saw no mnk or pup luas in the examples you had. unfortunatly not, i have to add martial arts as something sent by gearinfo to gearswap, i should be able to do that easily. As for the mache earrings, ill look into it, i must have missed em off the database. its hard to find everything. ill also look into the bug you are experiencing with the display. EDIT, did a full search on ffxiah for all items that contain martial arts, hopefully i got them all, i was missing a few. I added martial arts to what is sent to gearswap now in latest commit. I also added a specific gearswap repo to my GitHub with just the libs folder and my data folder. Youll find i added some code to the "player name"-globals.lua files and eddited some of the job files. notice sets.engaged.H2H is needed at start. I also added new buffs to be tracked in latest commit of gearinfo, these are composure and the jp bonus (if you have the jp) and also aggressor including the ranged acc from the merits and the bonus AGI from having the relic chest equipped with augment (evasion penalty is added and if chest is used then penalty is reduced by 10, i set the bonus to only be applied if the chest is equipped, not just for activation. please correct me if this is wrong). These new buffs also need testing please. the set bonus from rao is already in from the set bonus code i added a while back. all the MA stuff from the BG wiki page is what i already had in, the stuff i listed above is what i added in addition (i.e. what i had missing) so the BG wiki page was actually missing quiet a lot. so i decided to use the information from each individual page since the martial arts page is clearly out of date and missing a lot of items. Just grabbed latest fix, throwing a fit about songs again. In zone, loaded, trust bards singing, throws a billion error codes. Repeatedly until unloaded. "buff processing lua.233 song bonus is not defined"
Zone > load GI > call trust > they sing > billion errors. Fully deleted and re downloaded fixed the bard error issue. Hizamaru Somen +2 says zero equipped as well. Downloaded and installed latest version when loaded whenever a Cor rolls or doubles up it prints 'entered 1' into windower console. Deleted completely redownloaded latest version and reinstalled same thing whenever a cor rolls in range of me I get 'entered 1' in console. when you say deleted and re-downloaded, do you mean the latest commit or the latest release? cos those are 2 different things. Edit, you will also need to do a "//gi parse". I took the latest release and overwrote the old one. That's what caused the bard errors. //gi parse still didn't fix the martial arts, unless i need to unload and reload. ok you dont want the release, you want to manually download it from the commits here and hit the green button, download as zip. latest commit using Agressor on War main spams console with errors as long as the buff is on didn't check as /war. is the error I'm getting. thanks for letting me know, ill check it out. Just a quick update on this project. I got hired to design a website for a customer so life got a bit busy. I'll get back to updating this addon soon. Dont want people to think ive given up on it. When you do get back around to it, the Ynglinga Sallet is reporting 25 less accuracy than it should. I think it's reading the "Weapon skill accuracy +20" part instead of the "Accuracy +45" part. Anyways, Thanks for the hard work. This is a really handy tool. Good luck on the website. I created this addon over the last couple years with a few friends using it and testing it for me. I no longer play the game but wish to release it to the public. I'm still adding to the wiki, But please read up on it there before asking questions. I'm probably not going to be checking this forum post so if you have issues etc post them on the GitHub. There is enough information there to get people started. I welcome any well constructed critiques and will not reply to trolls. I hope you enjoy this addon. I'm not the best programmer and im sure people will have a lot of input. The addon tracks your equipped gear in real time, including their augments AND buffs like haste to give you on screen values. Then if you use it with Gearswap, (read the wiki) you can utilise the information calculated by GI to make gearswap auto change gear based on current haste values, DW equipped, etc. It even auto detects when your moving (and not engaged) and auto equips movement speed peices. This is all done in real time. This is its intended utility. Repo itself - use it to grab individual files if you need them or for new commits, or post issues there. My Patreon page or PayPal If you wish to support me and my work in any way. 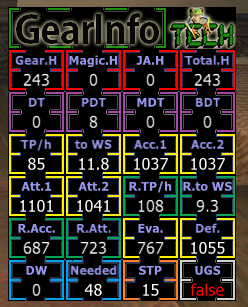 Maybe, (if i can be bothered), add tracking for pet stats from gear. The above is in no set order, and I'll only do if i have time. Current priority is bug fixing and helping people understand its use and how to use it. I really Appreciate everyone's feedback, its been extremely positive and useful. Only having myself and 2 others to test makes finding bugs difficult. With an army of players they have been fast incoming and its great (although i did release a massive load of code change on release. It was bug free for the most part before that lol). I'm glad everyone is finding it useful. I'll keep working on this for the foreseeable future even though I no longer play. I don't know if shameless plugs about donations is taboo in this community but if this was one of your though's then you can find a link on the home page of the wiki (however this is not why I'm working on the addon). This project is first and foremost fun for me, if it stops being fun, support will prob die with it ^^. and finally this is going to be odd but here is a link to my LinkedIn profile. If you are on LinkedIn and wouldnt mind endorsing my codding skills I would highly appreciate it as I am looking for work in the Programming department. Thanks.